Qualitative reasoning deals with information expressed in terms of qualitative classes and relations among them, such as comparability, negligibility or closeness. In this work, we focus on the different logic-based approaches to the notions of negligibility developed by our group. Partially supported by the Spanish Ministry of Economy and Competitiveness and the European Fund for Regional Development through project TIN15-70266-C2-P-1. \(\bullet \) A. Burrieza et al. Order of Magnitude Qualitative Reasoning with Bidirectional Negligibility. Current Topics in Artificial Intelligence, Lecture Notes in Computer Science, Vol. 4177, pp. 370–378, Springer (2006). With permission of Springer. \(\bullet \) A. Burrieza et al. A Logic for Order of Magnitude Reasoning with Negligibility, Non-closeness and Distance. Current Topics in Artificial Intelligence, Lecture Notes in Computer Science, Vol. 4788, pp. 210–219, Springer (2007). With permission of Springer. \(\bullet \) A. Burrieza et al. A Propositional Dynamic Logic Approach for Order of Magnitude Reasoning. Advances in Artificial Intelligence—IBERAMIA 2008, Lecture Notes in Computer Science, Vol. 5290, pp. 11–20, Springer (2008). With permission of Springer. \(\bullet \) A. Burrieza, M. Ojeda-Aciego. 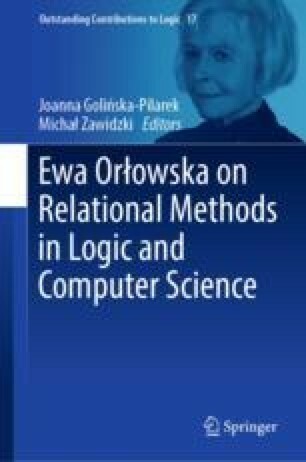 A Multimodal Logic Approach to Order of Magnitude Qualitative Reasoning with Comparability and Negligibility Relations. Fundamenta Informaticae 68(1-2), 21–46, IOS Press (2005). With permission of IOS Press.